Pulisic to Chelsea: promise or pressure? Is Christian Pulisic ready for the Premier League? That’s the question I’ve pondered recently. As far as world soccer goes, there really isn’t a bigger destination. The Premier League is the most watched league in the world, the most competitive league in the world, and, at least top to bottom, home of the world’s best players. It’s a big deal when an American player makes the move. A few are there now, including DeAndre Yedlin for Newcastle and Tim Ream for Fulham, but those guys aren’t stars — Pulisic is the star. His recent move to Chelsea surprised me a bit. It’s not that Chelsea is too big or that Pulisic is not good enough to play there, but the timing seems odd. As most soccer fans know, the young American has broken out the past few seasons at Borussia Dortmund in the German Bundesliga. It’s a very big club in a very big league that has treated American players very well of late. 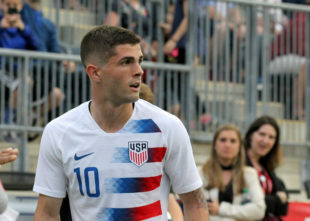 After joining and making a few senior appearances in the 2015-2016 season, Pulisic put together back-to-back campaigns with five goals and made an international name for himself. Ok, good. Chelsea doesn’t seem so far-fetched. This season, though, things have slowed down a bit. Pulisic has made just 11 league appearances and scored one goal. Part of it has been Pulisic’s lingering calf injury, but a closer look also points to Jadon Sancho, a young Englishmen that also typically suits up on the right wing. Sancho has started almost double the matches Pulisic has and scored seven goals. At some point, Sancho is no longer just filling in for an injured teammate. At some point he is winning the job. To be fair, Sancho is a special talent and plays at a very high level. Dortmund also wouldn’t start Pulisic in the Champions League if he wasn’t capable of performing. Still, it’s all worth noting because, at least right now, the wingers at Chelsea are considerably better than Sancho. Even if it were a match or two, how does losing time to him translate to one of the biggest clubs in England? We’ve all seen what Pulisic can do in an American kit, but we’ve also seen a number of Americans flop in the Premier League. Being the best player and the biggest star the federation has seen in years doesn’t guarantee success at a place like Chelsea. Sadly, dreaming of playing in England as a kid doesn’t guarantee you a spot in the starting XI. Let’s recall that Chelsea manager Maurizo Sarri didn’t even know the Pulisic deal was going through until a couple weeks ago. That could mean a number of things, but it definitely means Pulisic will have to earn his playing time. That being said, the starting XI at Chelsea may look significantly different next season. Cesc Fabregas has already moved on to Monaco; Eden Hazard is still being constantly linked to Real Madrid; and despite Sarri recently quieting some transfer noise on Willian, it looks like he may be gone too. That would naturally make the equation simpler: two wingers out, one winger in. However, anyone that follows Chelsea knows that ownership will not hesitate to splash cash at a high profile player, especially if a spot is vacant. We could give them the benefit of the doubt and say the Pulisic signing is directly related to Hazard and Willian potentially leaving, but I’m not so sure about that. A spot could open up, but it’s far from a guarantee. Sarri may not rate Pulisic as highly as others do and, hell, Sarri may not even be there next season because Chelsea changes managers like I change socks. It’s tough to predict what the future holds. But even more than the uncertain situation at Stamford Bridge is the pressure of it all. At Dortmund, a player can play on the world stage and avoid constant scrutiny. A player can fight for a starting role or go through a slump and it won’t always make headlines. It simply doesn’t work that way in the Premier League. Especially at a top six club, the cameras are always on. Every mistake is highlighted, and the headlines don’t stop. The English football media is relentless. That won’t apply as much to Ream or Yedlin as low-profile defenders, but Pulisic now has a 73.1 million dollar target on his back. As a Fulham supporter, I can emphatically tell you that the Premier League doesn’t care about money. It doesn’t care about how much players are worth or how famous they are in their home country. If a player is not good enough, the Premier League will chew him up and spit him out onto the bench. Even for Chelsea, 57.6 million pounds is an awful lot to pay for a young Premier League first-timer. The question is: Can Pulisic live up to it? Chelsea is on NBC and NBCSN almost every week, and most of that viewership is American. From his first appearance, the hype will be immense. Even if he doesn’t start all the time, people will expect a lot out of him. Regardless of the level of competition, viewers will expect him to score goals. Fair or not, the pressure to perform will be a reality. Can Christian Pulisic play through it? Despite my prerequisite hatred of Chelsea, I hope he can. He’s the future of American soccer and his success on the grand stage could open a lot of doors for rising talent. The good news is, as harsh and unforgiving as the Premier League can be, it can also be that much more rewarding. The failures are blown up, but so are the positives. If Pulisic does start hot and do well, he will be given even more praise than he deserves. He’ll have every chance to be the hero everyone thinks he’s capable of being. Just remember that Americans don’t have a great history in England. Before you watch Pulisic play in blue, just remember what it actually is. I hope he’s ready and I hope he turns into the next Clint Dempsey. American soccer could really use one. Author: Christian Sandler Christian has a degree in journalism but now sells golf clubs for a living. Funny how that works. He grew up in Tampa, but has roots in Bucks County, where he now lives. Find him on a golf course or in movie theater. The Philly Blues, who watch all Chelsea games at Tir Na Nog, are looking forward to see him in Blue (rather than yellow or red). There will be plenty of games in which he can show what he can do (since Chelsea tend to go far in the various Cup Competitions). I hope that with him Chelsea will come back to Philly and will give the Chelsea fans a special treat like they did back in 2012. Pulisic doesn’t seem to be the type to shy away from a challenge. Moving to Chelsea is in line with that. Sure it’s possible that this move could hurt him, but at least he is making the effort to try. That’s better than making decisions out of fear IMO. The coach that brought and played him at Dortmund also left and their style has changed to one that does show off Pulisics strengths. I think a move for him makes sense. Hopefully he chose the correct spot. Dude hasn’t been wrong yet though so I’m not going to doubt him. While the transfer fee suggests Pulisic will be more than a bit player, I was worried by Sarri’s comments that he didn’t know anything about the transfer until he read about it in the papers. That doesn’t inspire confidence. The PL will certainly be a challenge. I hope he lives up to it. I’d hate to see him follow the Vincent Janssen route — break a record as the most expensive transfer from AZ after winning the Johan Cruyff player of the year award, only to be buried in the Spurs depth chart, never to be seen or heard from again. Re your first two sentences: I think those comments were tactical. He doesn’t want to upset the players on his depth chart, lauding a newcomer and all, and also doesn’t want to be the manager that puts undue pressure young stars. That being said, I think Sarri is a coach’s coach and will do well to cultivate the kid from Hershey. I’m not a blues fan by any stretch of the imagination but am looking forward to finding something to root for in their matches. Nice, thanks for the link. In my opinion, which amounts to nothing, I would have liked a lateral move for the player: a Leverkusen, Monaco, Feyendoor type ultra high level Champions League move but just a notch below Chelsea, Real, Juventus type environment. Something’s telling me this is the move after the move.